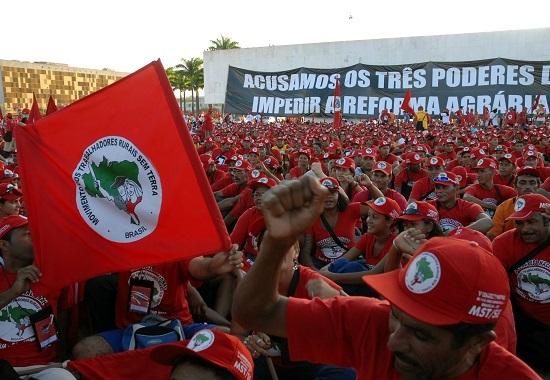 Brazil’s Landless Workers’ Movement, MST, takes a profound look at Brazil’s political crisis, how it affects the working class, and how they must respond. 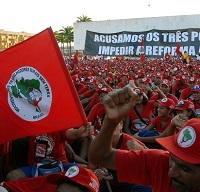 Brazil’s Landless Worker’s Movement, MST, takes a profound look at Brazil’s political crisis, how it affects the working class and how they must respond. The Brazilian political crisis has gained momentum and speed in recent weeks. Every day we see complaints, accusations, threats and assumptions about the outcome of this crisis. The incitements of hatred and violence from the right are increasing with threats to activists and organizations. In the midst of such misinformation and rumors, many may feel lost or discouraged by this situation. It is therefore important to be clear about what is at stake as well as who and what interests are involved. To understand the current Brazilian political moment, the first element that we take into account is that this crisis is not exclusive to Brazil. Rather, it is an ongoing result of the economic crisis started in 2008, which affected numerous companies within the international capitalist system. Entire countries went bankrupt and the organization of the world economy was thrown out of balance. What is in dispute now is precisely how to organize the economy in the years to come. Capital throughout the world has clear designs for a way out of the crisis: lower commodity prices (agricultural, oil, etc.) and reduced wages and workers’ rights to ensure their rate of profit. This is the project that they are trying to deploy throughout Latin America, which also involves realigning our countries with the United States. This is why Brazil is now going through an offensive by the right, similar to what we have seen in Venezuela, Bolivia and Argentina. But this exit from the crisis places the burden of sacrifice on the backs of workers so that capitalism can function again. This way out only increases the social crisis because in order for the plan to function, unemployment has to increase while rights have to be decreased. Moreover, the economic crisis has unfolded within other crises such as the environmental crisis, which has entailed the wanton destruction of the environment such as we have seen in Mariana, Minas Gerais – where the dam broke, releasing toxic sludge by Samarco / Vale do Rio Doce – and the crisis in values, where what counts is every man for himself and commodities valued above human life. In Brazil, this project is clear. It means reducing gains and social rights such as retirement (raising the retirement age), lowering wages, ending the labor portfolio (and all its achievements such as vacation, FGTS, 13 month salary). It also means handing over important mineral resources such as oil from the pre-salt layer to foreign companies, as well as hydroelectric power plants, public banks (Bank of Brazil, Caixa Economica) and suspending social projects. What aggravated the economic crisis in Brazil is that, with it, we are facing a political crisis. On the one hand, we have a government that was elected to advance achievements and social rights. But it cannot fulfill the platform that got it elected. On the other hand, we have a Congress that was not elected by the people but by large corporations through millions in campaign donations. The corporations end up deciding who will be the representatives and senators and deciding how they will vote. In 2015, for example, the whole agenda of the National Congress will go against the rights of workers but will benefit corporations: such as outsourcing jobs instead of a work card, reducing the age of criminal responsibility for children of the poor, and withdrawing the exclusive right of Petrobras to explore for oil in the pre-salt layer. The way out of this situation would be a profound political reform, through an exclusive constituent assembly and prohibiting private campaign donations, more transparent campaigns and creating other mechanisms for people’s participation, especially on key issues through referendums . What fueled the political crisis was called Operation Car Wash, a legitimate investigation into the resources illegally donated by companies to politicians in exchange for jobs and million-dollar contracts. Politicians of all parties are involved in the complaints, but Judge Sergio Moro, of the Public Ministry of Paraná, is only targeting the politicians connected to the Workers Party (PT). The actions of Sergio Moro find partnership in other sectors of the judiciary and Globo Network, which illegally has access to research data and publishes only what interests it. Also the judiciary, as well as the media that acts without accountability to anyone, because they are not elected and there are no social control mechanisms in Brazilian democracy to curb the abuse of power. Since it did not win at the ballot box, the right’s project of privatization and defending capital wants to win “on the carpet,” as they say in football. They want to win by changing the rules of the game, with the game in progress and without consulting the people. For this, their first goal is to take out President Dilma Rousseff. For all the mistakes that her government has committed, it is undeniable that it was democratically elected and has not been charged with any crime. Therefore, there is no basis for impeachment, for a withdrawal of the President. The only thing left is action by the right to end democracy. But it is not enough for the right to remove the President. The crisis is long-term and their project must also last longer. Therefore, besides impeachment, the right is working to remove any candidate who can defeat them in again in 2018 and so it is important to tackle the Workers Party (PT) and its main leader, former President Lula. So far nothing has been proven against President Dilma or against the former president. But the media, especially TV Globo, and social networking feed and give wide publicity to the rumors and lies, enough to convince the workers that the events actually happened. Since this process does not respect the Constitution, does not respect the laws or institutions, it is a coup. Just like the military did in 1964: they pass over the population and impose their law. And if they do it now with a legitimately elected President, they can do a lot worse with the popular movements, also passing over our rights when we engage in struggles, detaining leaders without justification, etc. And to create this climate, the right also encourages right-wing sectors to organize demonstrations and attack activists, party headquarters, trade unions and movements. In fact as capital faces a serious crisis, which means a falling rate of profit, failing companies, competition with other stronger foreign capitalists. It is also a concentration of wealth in the financial system. They need to have broad powers to make the neoliberal changes in the economy. To recover their rate of profit they need to do away with historical rights won by workers. They need to raise the unemployment rate in order to force wages down. They need to reduce the public resources that previously went to education, health, agrarian reform, and apply all of these resources to their investment model. They want lower taxes, as if they were the ones paying. They need to complete the cycle of privatization, with the latest electric companies, and especially of oil, which are sources of wealth and extraordinary income for the capitalists. But to apply this neoliberal model, they cannot make a coalition government as Dilma’s government is. They need to have broad powers. And they need to make a coup, take out Rousseff and leave Vice President Temer, to do what they want. The smoke of corruption has nothing to do with the crisis. Or do you think that after the coup, the Car Wash operation will imprison 316 politicians listed as defendants, as recipients of bribes from contractors? Or will TV Globo explain where the funds for the illegally built mansion on the beach in Paraty came from? It is of record that the parent company is the same one that paid bribes for the expenses of former president Fernando Henrique Cardoso. These are difficult times, but also times of struggle. The tasks ahead are large and are not short-term. First, we need to study and know the situation. Bring together neighbors, friends, and have discussions, knowing the opinion of the popular movements and not getting carried away by the information that the mainstream media bombards us with every day. One should also know that the right will be more aggressive and it is important to guarantee the safety of all activists, taking care not to fall into provocations and preserve the heritage that we have built. Second, and more importantly, we have to have struggle. To block the movements of the right, only with people on the street, discussing with society and showing our organized strength so that they realize that they cannot go above the laws without any consequence or end democracy in our country. In the building of these struggles, we have to form alliances, bringing together the parties, trade unions, and men and women workers who want to struggle. A tool that popular movements have built for this battle is the Brazilian People’s Front, which brings together activists from different organizations around two ideas: we must defend democracy and win more social rights with changes in economic policy. Now the main thing is to be organized and fight. But we also need to build a Program of Emergency Measures, to help pull the country out of the crisis without taking away workers’ rights, but through passing the bill on to the capitalists. A program that invests in housing construction in urban centers, improves health care, creates more jobs with much-needed public works projects, which carries out agrarian reform and improves the situation of food production in the countryside. The class struggle has intensified. This means we have to engage in more struggles, some taking a longer time. But it is only struggle that brings achievements and the changes needed for all of Brazilian society.